Brouwerij Frankendael is a craft brewery founded in 2015 focused on making beers with a strong personality and unique flavors. Building forth on the comic illustrations we developed the visual identity and responsive website where the comic feel and experimental character of the brewery come to life. The typography consists of a comic typeface for titles, names and logo's and a sans-serif typeface with a strong personality for longer readable text. Every logo of the beers contains a pattern of the ingredient that makes the beer unique. Design for the beer label template. Beer image zoomed in on the label. Beer finder page where you can find locations to buy the beers. 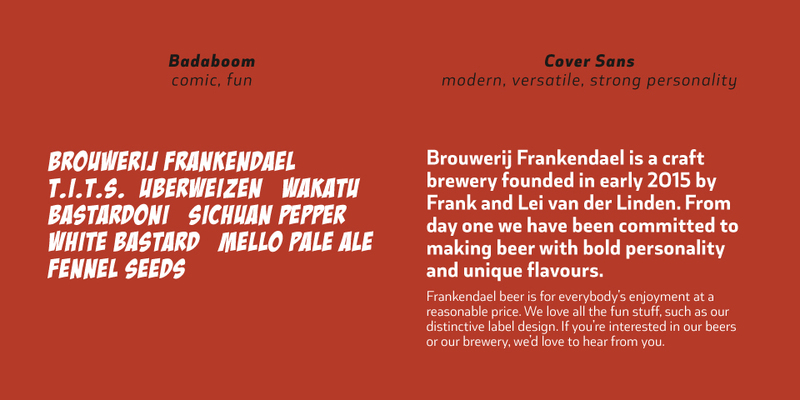 Further development of the visual identity and beer label for Brouwerij Frankendael and the design of their new responsive website. The website is setup in a way of a comic. We took inspiration from old comics like the use of a circle to zoom in on a situation, or in this case the ingredients and the vertical title bars. The website takes the full size of the viewport making the most use of the space for the images and content. Comic illustrations by Jeroen Canton. See it online at brouwerijfrankendael.com.